Photographs By Mari Mahr. Poems By Gregory O’Brien. Mari Mahr, an internationally known photographer, was born in Santiago de Chile in 1941; she studied and worked as a press photographer in Hungary, before moving to London in 1973. She now divides her time between there and Berlin. She has exhibited widely and produced a number of books, A Few Days in Geneva published in 1988, and the retrospective volume Between Ourselves in 1998. Her work is in many collections, including the V&A, London; the Bibliotheque Nationale, Paris; the National Museum of Photography, Hungary; the National Gallery of Australia, Canberra; and the Tokyo Metropolitan Museum of Photography, Japan. Gregory O’Brien first encountered Mari Mahr’s photographs in 1988 when she exhibited at the George Fraser Gallery, Auckland. They have been in contact ever since. A poet, essayist, artist and curator, Gregory O’Brien is author of A Micronaut in the Wide World – The Imaginative Life and Times of Graham Percy (AUP, 2011). Mahr’s photographs date from the time when her late husband Graham Percy first became very ill. Percy was a New Zealand-born artist, illustrator, typographer and designer, and many of Mahr’s images register his presence. In the context of the city of Edinburgh, objects such as a paint brush, an open book and an ancestral fob watch become private monuments to his life and work. Much of Mahr’s photographic work is concerned with architectural forms and constructions; here it is the architecture of grief at stake. Collage-like, Mahr’s methodology is one of salvage, holding on to and making visible that which remains. O’Brien’s brief and imaginative poems are tender memorials in verse and prose to places and people: ‘nothing/out lives you/you live/on’. 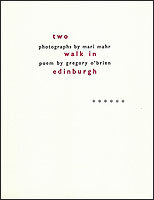 Two Walk in Edinburgh was designed, letterpress printed and bound by Brendan O’Brien for The Holloway Press on a Littlejohn cylinder press using metal types. The text is Janson 12 and 14pt, linotype set by Longley Printing Co and the paper is Zerkell Special Edition White. 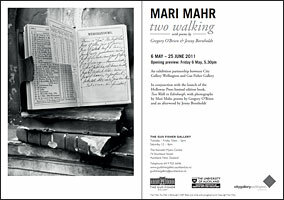 This publication coincides with an exhibition of Mari Mahr’s Two Walk in Paris and Two Walk in Edinburgh at City Gallery, Wellington and Gus Fisher Gallery, University of Auckland. The photographs are original digital prints on Digiprint paper, produced at Imagelab, Wellington. An edition of 90 signed and numbered copies. Pre-publication price, up to & including May 6, 2011, $180. From May 7 the price is $225. Two Walk in Edinburgh will be launched at City Gallery Wellington, Wednesday April 20 at 6pm and at Gus Fisher Gallery, 74 Shortland Street, Auckland at 5.30pm Friday May 6. Mari Mahr, Gregory O’Brien and Jenny Bornholdt will be present on both occasions.